Whether you are an athlete, in your golden years of retirement, or the typical person on your feet all day at work, you know there’s nothing more debilitating than a knee injury. Knee injuries have many faces and causes and these three groups of people are susceptible to the same injuries but from different causes. Tendon injuries are the most common: Iliotibial band syndrome (pain on the outside of the knee) usually seen in runners or cyclists, Patellar tendonitis or commonly referred to as Jumper’s Knee (pain below the knee) usually seen in athletes who jump frequently for example Volleyball and Basketball, and hamstring injuries (leading to pain in the back of the knee). As well, arthritis plagues many and often results in knee replacement surgery. And unfortunately, many knee surgery patients (due to ligament or cartilage tears) frequent our office. Each of these injuries comes with its own set of obstacles when treating with conventional methods: tendonitis can create fibrous adhesions and scar tissue that disrupts the normal function of the muscle; arthritis erodes the cartilage, decreasing the joint space; and surgery, although often necessary, creates scar tissue on the surrounding muscle and tendon, binding the knee and often creating soft tissue pain. For the past four years I have been using Extracorporeal Shockwave therapy (ESWT) to treat these conditions, because shockwave therapy breaks down scar tissue and stimulates blood vessel growth to restore muscle function and promote healing. The Journal of Surgical Research 2012 showed ESWT is effective in preventing knee arthritis. In The American Journal Of Sports Medicine 2007, 90% showed significant improvement in patellar tendonitis. 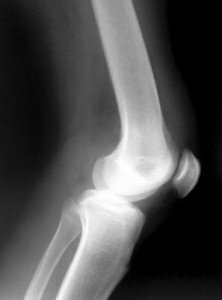 Furthermore, The Archives of Orthopedic Trauma Surgery 2007 showed significant reduction in the progression of knee arthritis (Shockwave therapy stimulates cells to produce cartilage). Knee injuries often turn into chronic knee pain as many people believe rest and medication will solve their problem. This will work for some, but most will need some form of therapy or even surgery to relieve the pain. Shockwave Therapy has shown great success in treating chronic knee pain both in my clinic and research studies. Results are often experienced within a couple of visits and the treatment is covered by many insurance companies. Visit our reviews page on Shockwave Therapy to see what others have experienced.